Anton Turner’s design was very practical and his two sketches for the design appear to have gone missing. However, in discussion with him, his solution to the Riverfront space was to create a corridor using black cotton material (king sized bed sheets) running from the bottom entrance door of the Riverfront, and allowing the audience a pathway and a theatrical experience where the screens would be hidden until they entered through a gap in the curtains. 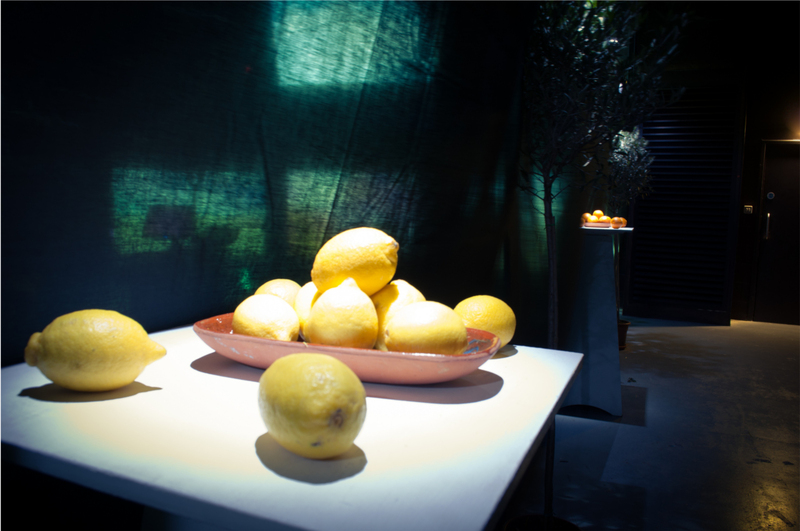 The environment was dressed to create the experience of being in an ancient Greek olive grove – Anton bought 6 olive trees, and the corridor was lined with plinths containing bowls of lemons.